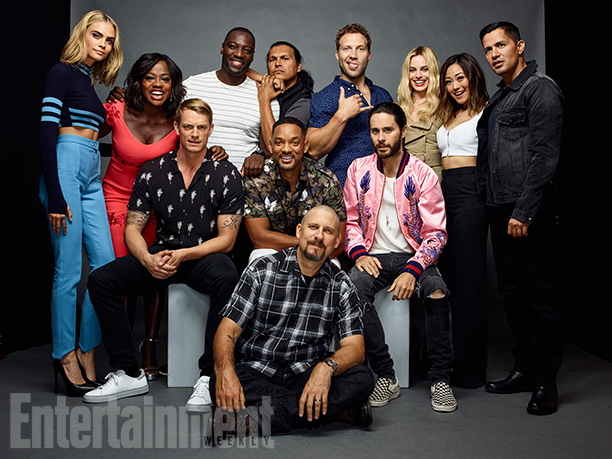 Suicide Squad Cast @ Comic-Con 2016. Cara Delevingne, Viola Davis, Adewale Akinnuoye-Agbaje, Adam Beach, Jai Courtney, Margot Robbie, Karen Fukuhara, 松鸦, 杰伊, 杰伊 · Hernandez, Jared Leto, David Ayer, Will Smith, and Joel Kinnaman. Wallpaper and background images in the Suicide Squad club tagged: photo suicide squad cast. This Suicide Squad photo might contain 精心打扮的人, 西装, 裤套装, 裤装, 穿着好衣服的人, 裤子套装, 穿得好的人, 套装, 浴衣, and 睡衣.